Well, more like damning with faint praise, I suppose. It is not that I don't like Aeoniums; I actually think that they are very nice plants. They are just not particularly easy plants for people in cold winter areas, particularly those of us whose winters are both frigid and dark. Not only are the winter days short, but here in northern Illinois, bright and sunny days are rare from December through late February. And, alas, Aeoniums are mostly winter growers. I put them out dutifully in the spring, usually just in time for them to go dormant. Some of them will close their little heads tightly, as if to say, "Would somebody turn out the lights? I'm trying to sleep here. And no, I really don't want anything to drink." The others just sit there, doing nothing. Then in the late fall, just when I have to bring them in, or else, they open up again. And there they are wide awake, in the meager light of winter, straining toward the south windows, as if to say "Gee, it's dark in here." If I place them under fluorescent lights, they do okay, but often lose their color. "What a lousy sun lamp; I'm losing my tan. And can a body get a drink and something to eat around this joint?" Since they are grouped with my other succulents, most of which are sensibly using winter as a time to catch up on their beauty rest, I tend not to water them as much as they might like. This results in leaves drying up and falling off. Aeonium 'Sunburst' and what may or may not be Aeonium manriqueorum 'Zwartkop,' outdoors, enjoying the brief window between late spring growth and summer dormancy. 'Zwartkop' is already tightening up. It is hard to believe that this elaborately crested Aeonium 'Sunburst,' is just a monstrose version of the plant to its right. I spent about half an hour last Saturday removing tiny dried leaves from its tightly packed clusters. 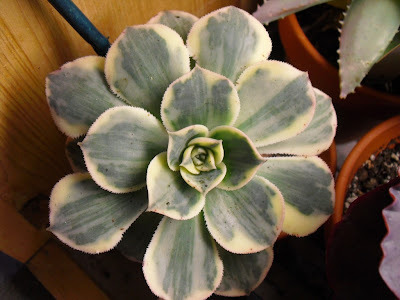 Aeonium 'Sunburst' yet again, with its colors somewhat faded, indoors in fall. Succulent grouping on my back stoop. 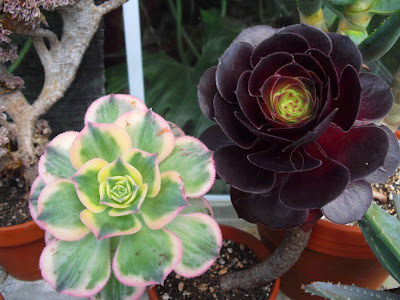 To the left, on the wooden table, are Aeonium arboreum atropurpureum and a very faded Aeonium haworthii 'Pinwheel'. The Aeoniums pictured in close shots above share the wire shelf with Aloe congolensis, Aloe hemmingii, Aloe brevifolia, and Aloe ramosissima. This picture is much better when viewed full-sized, so clicking it is recommended. So, though I try, my Aeoniums are never quite looking their best. And if they really could talk, they would probably agree: "Oh well, she does the best she can." So the faint praise comes right back to me, damn it all! WCW told me a long time ago that Aeoniums never did that well for her either, so I've never tried them. But I've definitely been tempted. They're often extremely pretty. Nice! I didn't even know what an Aeonium was when I lived in Wisconsin. If they ever get really cranky with you feel free to send them to San Francisco. They LOVE it here. The wet winters and dry summers are perfect. I guess you need to copy and paste! 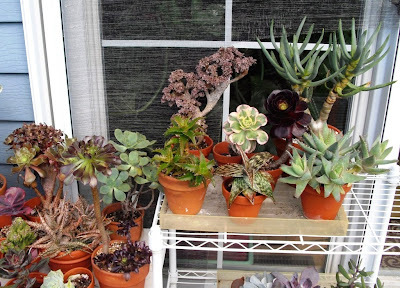 Your succulent grouping looks lovely; too bad about the Aeoniums having such an inconvenient growth schedule. I never realized that they were winter growers. @Mr Subjunctive: They are pretty, and I think I could do better with them if I paid more attention to watering in the winter. I'm considering switching them to plastic pots this fall when they come in. 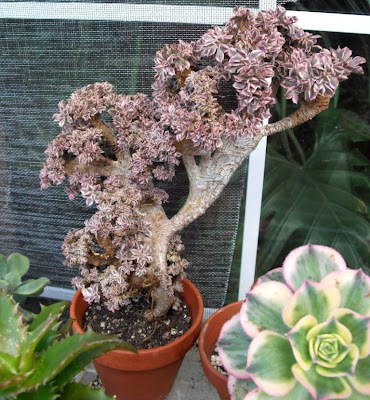 @Candy: Your Aeonium is gorgeous! @College Gardener: You're welcome, and thanks for the compliment. I didn't know they were winter growers at first either. The first summer I had one, I thought the head closed up because it needed water. I'm glad I didn't rot the poor thing. What a really cute post! I had a gorgeous huge purple aeonium a few years ago and I never could figure out what it wanted...it finally died. They can be tricky everywhere but on the west coast, I guess! Lucky Californians!!! (I am in south Florida). You've long known that Aeoniums are some of my favourite plants, and even grow well here in Kamloops. I don't see Aeonium balsamniferum there among your collection - did I not send you any? Jeff, you did indeed send me some. In fact, it was the plant licked by my dearly departed doggie Laces in the anecdote in this post. Alas, it was one of the few plants you sent that I didn't do well with. It got all spotty and weird-looking, so with much regret, I threw it out last year. Thank you, jasmin, I appreciate the compliment. No, I'm not on Twitter or Facebook right now.